We're excited about trying new recipes and different ways of making food, yet one thing remains true - we are looking for simplicity and simplicitiy comes in the form of the ingredients, the method of preparation, and more importantly the limited time it takes to prepare these dishes. The simple pleasures I talk about in my column this week refer not to the new, simple and easy-to-prepare dishes I have learnt (I'd need more than one newspaper page for that) :) but rather to the simple foods and things about food that I enjoy. I invite you to read the column and come back to this virtual dining table and share some of your simple food pleasures. 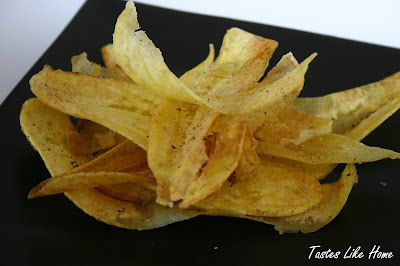 Green-plantain chips are such a treat - crisp, savoury and can't-stop-till-it's-all-gone. At school we would buy and eat these daily. They make for a nice appetizer. A must-have on games night, movie night or anytime! 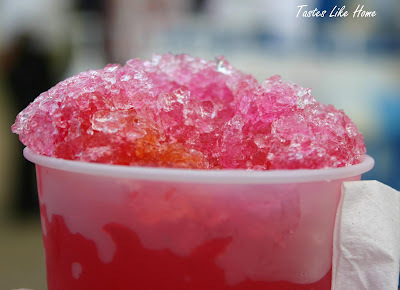 Snow cone! Everyday the snow cone man passes in front of my house, honking his horn :) But I don't eat it everyday. Only now and then. Ice and syrup - quite an indulgence. Long ago these used to be served in a pointed, paper-like cup but these days they come in plastic cups.